Although there are many different models and methodologies for the creation of training materials in the eLearning world, the ADDIE model is, undoubtedly, the most popular of all. If you are a veteran, you certainly know what ADDIE is and how to create in line with that model, and I doubt I will be able to tell you anything you do not already know. However, if you are new to the industry, or simply have not heard the name before, this article will get you up to speed, introducing you to the methodology and showing you how it can help you. 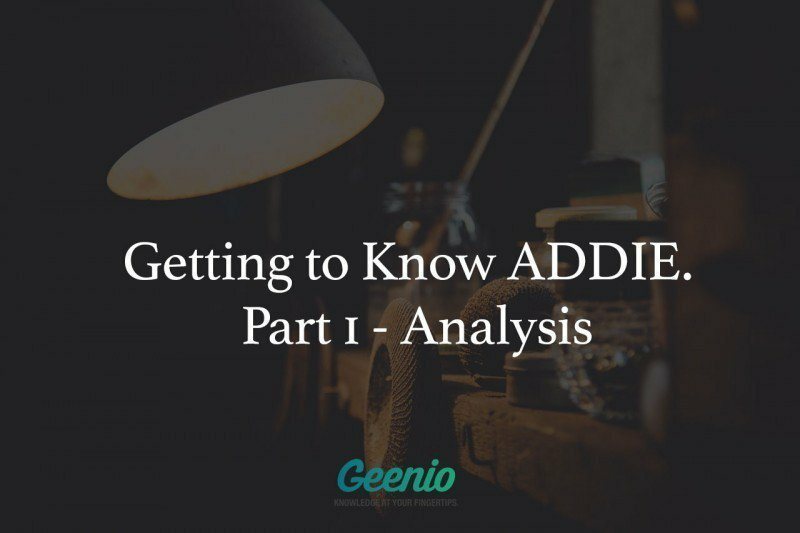 In a nutshell, ADDIE is an acronym where every letter corresponds to one of the model’s main phases: Analysis, Design, Development, Implementation, and Evaluation. The ADDIE methodology was developed in Florida State University’s Center for Educational Technology back in the seventies. Initially, the model was meant to be used in the US armed forces, a fact to which it owes its streamlined processes and clear delineation of phases. Despite being nearly forty years old, the methodology has not fallen out of use; indeed, it has remained the leading eLearning methodology to this day. This popularity is owed to the fact that ADDIE is simple to use, flexible, and versatile. It is easy to learn, whether you are an eLearning master, or have just recently entered the industry. Another benefit of ADDIE is that it is cyclical; that is, it enables you to correct the errors made in previous iterations, thus improving the quality of the end product. Of course, the model is not without its drawbacks. The linearity of the content creation process is considered its main drawback, as it can negatively affect both the course creation cost and the time requirements. This led to the development of alternative, agile development-based course building methodologies, which lack this drawback, but have other drawbacks of their own. Besides, they are neither as easy to use nor as well-known as ADDIE, so let us get back to ADDIE for now and see what makes it tick. Who is the primary target audience for the course. Who will be using the learning materials you produce for studying? Are those learners domain experts looking to broaden their knowledge, or newcomers just making their first steps? Certain common traits shared by the members of the target audience (e.g. knowledge from an adjacent domain, or the overall computer literacy level) can greatly impact the way the finished course looks. Age, gender, socioeconomic status, experience, education; all of those inform the way the learning materials have to be presented to achieve maximum learning efficiency. What are the learning goals you aim to achieve. Before starting to work on teaching materials, it is vital to determine the main learning goals and clearly communicate them to everyone involved in the creation of the course. What does your course aim to teach? What knowledge and skills it will impart to the learners who complete it? Having unambiguously set these goals right at the beginning, you will make your life much easier, as it will enable you to ask yourself “Does this page meet the needs of the course? Do the materials presented on it help advance one of the course’s goals?”. The goals must be described in detail from the outset, and they must be measurable. Another way analysis can help you is by enabling you to discover early that skills you aim to impart in your course are ill-suited for eLearning and require live courses with workshops. Thus, establishing this early will help save you a lot of time that would have been wasted otherwise. What are the physical and organizational constraints. Are there any limitations imposed by the rules of the organization you design for that need to be taken into account? Is the overall length of the course or the time allotted to the study of individual modules limited in any way? In what setting the education will take place? In a physical classroom/auditorium, or remotely? Do the physical rooms meet all the requirements of the course, or can those requirements be met should the need arise? Will the setting impact the effectiveness of education? What are the technical requirements of the course. The bandwidth of the learners’ internet connections. Whether the learners are equipped with the devices necessary for audio playback (sound cards, speakers, headphones, and/or microphones). The list of software pre-installed on the learners’ computers. The list of browser plugins necessary for participating in the course (Java Virtual Machine, Flash, etc). What browser(s) the learners will be using to access the course. What are the structural characteristics of the course. Do you need to split the course into individual modules and include step-by-step instructions? What weight is to be assigned to each test? Will the modules differ in size and importance? How will the learners use the course material in the future? How accessible are the requisite knowledge sources. Are the necessary information sources available in-house, or will they have to be found elsewhere? Is information about the course’s topic available on the Internet? Is it easily accessible? Are there any materials on the topic that have already been written/created? Perhaps a different course that was used in the organization before? Are there Subject Matter Experts (SMEs) within the organization that can help you work on the course by sharing their knowledge and expertise? Will the said Subject Matter Experts be available to assist you with preparing the course? What criteria will be used for assessment. How exactly the students will be graded after the completion of the course? Will you use small timed tests that will be graded, or will the effectiveness of the course measured by the practical skills the learners acquire after completing it and the corresponding increase in productivity? If you plan to assign grades to learners, what will be the passing grade, and will a learner be able to pass a failed test again to improve their result? This will be all for today. In my next article I will tell you about the second ADDIE stage - Design. And if this article was of interest to you, you may also be interested in learning about alternative Instructional Design models in the meantime. Try searching for information on RAD (Rapid Application Development) or SAM (Successive Approximation Model).